When we were asked to provide sound engineering duties and stage monitoring equipment for a Filipino night at the Buttermarket, in Shrewsbury, we weren't really sure what to expect. The band booked were unknown to us, but to a large proportion of Filipinos they are huge; The 70s Superband! Today we were back at Battlefield 1403 for a local gig with our good friends Fallin' Apart at the Seams. The band are a 3 piece blues/rock group who play a mixture of original music and their take on some classic blues and rock. A gig over the bank holiday weekend has never been so emotional for our team. 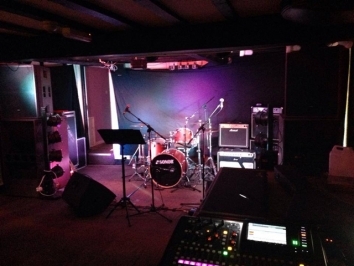 Tonight we provided sound for the final "Live at The Kings", at the Royal Head pub in Llanidloes. Variety is the spice of life. Today has certainly provided us with some variety. We've been up at Bodelwyddan Castle & Park providing equipment and services for the amazing Knights of the Damned Jousting Stunt Team. Wow! What a weekend. We're just finishing our pack down after another successful Shrewsbury Food Festival. A great weekend had by all and we loved providing the sound system, stage monitoring, drum kit hire, FOH and monitor mixing duties.